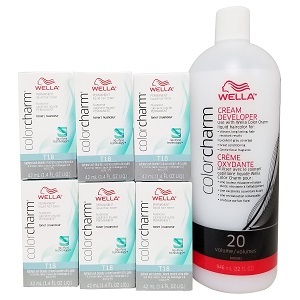 Wella Color Charm's packaging utilizes a color-coded tonal family system, making shade selection easy! Liquid Permanent Hair Color time tested formulations ensure consistent, predictable results. Liquifuse Technology saturates, penetrates and fuses with the hair to deliver vibrant color that is exceptionally fade resistant. A gentle floral fragrance for a more pleasurable coloring experience. See packaging for instructions. For Professional Use Only. Test areas before use.